I had been living in MacArthur Park a bit more than a year when the body was pulled from the lake. It was 2012, a windless September morning, and from my apartment window I had just snapped a picture of the sunrise, a ribbon of tangerine singeing the woolly sky above downtown. The water was flat and glassy and dark as a bruise, a collision of serenity and gloom. Somehow I missed the commotion: He was suddenly just there, 13 stories below, laid out on a concrete jetty. By the time I made it down, the police were wrapping yellow tape around the trunks of palm trees. His feet poked out from under a white sheet. A puddle formed around his silhouette. I would learn that his name was Roy Robin Jacobs, that he had turned 66 the day before, that he had a wandering right eye, a biblical white beard, and no teeth. He also had a history of schizophrenia and alcoholism, which seemed like a risky combination for a lakeside visit. The official verdict was drowning, by accident. There was no sign of trauma, no indication of a deliberate act. Not even a trace of booze. When I e-mailed a Rampart cop I know, he wrote back: “wasn’t wearing his life preserver.” The absence of a crime, so contrary to the lake’s reputation as a dumping ground, proved less reassuring than I expected. Something had brought Roy Jacobs to the shores of MacArthur Park—south of Wilshire, west of Alvarado—beckoning him closer to its 14-foot depths than someone as unwell as he should have ventured. Every morning since then I have begun my day staring at the lake, puzzling over its allure: a man-made body of water with a habit of claiming bodies. On a January afternoon in 1890, when MacArthur Park was Westlake Park, L.A.’s newest pleasure garden, Harriet Hutchins left her home near downtown. By supper she had not returned. The newspapers reported that Mrs. Hutchins, who was 51 and married to the pastor of First Congregational Church, had been suffering from “melancholia.” Her condition was likely related to the death, eight years earlier, of her teenage son; swimming in an Eastside reservoir, he had become entangled in the weeds and clay. A day after she vanished, her body surfaced in the waters of Westlake—“one of the saddest affairs that has ever taken place in this city,” the Los Angeles Herald called it. By 1900, seven other people had drowned themselves in the park, including a chambermaid, an LAPD patrolman, the sister of the British vice-consul, and a bartender at a German saloon, who had fastened a rock to a shoestring and tied it around his neck. More attempted it, only to be rescued, and more threatened it, only to be exposed as hoaxers. For a time, whenever anyone went missing in Los Angeles, the first impulse was to check the lake. As the city grew and the park took on new identities—fashionable getaway, pensioner’s haunt, immigrant refuge, gangster cross-roads, and lately, scruffy relic sputtering toward gentrification—bodies kept getting swallowed. Some decades, the lake’s toll grew every year. There were reckless boaters and disgraced lovers and assault victims who stumbled into the muck. A sailor. A peanut vendor. A stable groom. Max, the pinochle player. Stuart Engstrand, the author of “brooding novels dealing with human abnormalities,” as the obits put it. A few of the lake’s dead spoke to larger tragedies, like John Ray Thompson, who on July 23, 1951, was detained on a “morals” charge after making advances to a vice officer; he broke loose from police and flung himself into the lake, gulping water as he fought off rescuers. Or Julio Marcial Chicas—the Salvadoran-born “King of MacArthur Park”—who on May 19, 1982, was offered $3 to retrieve a plastic tricycle from the water and was too dulled by cheap wine to find his way out. Originally a foul swamp that swelled and withered with the seasons, Westlake entered continuous lakehood only after the city tapped the municipal water supply. 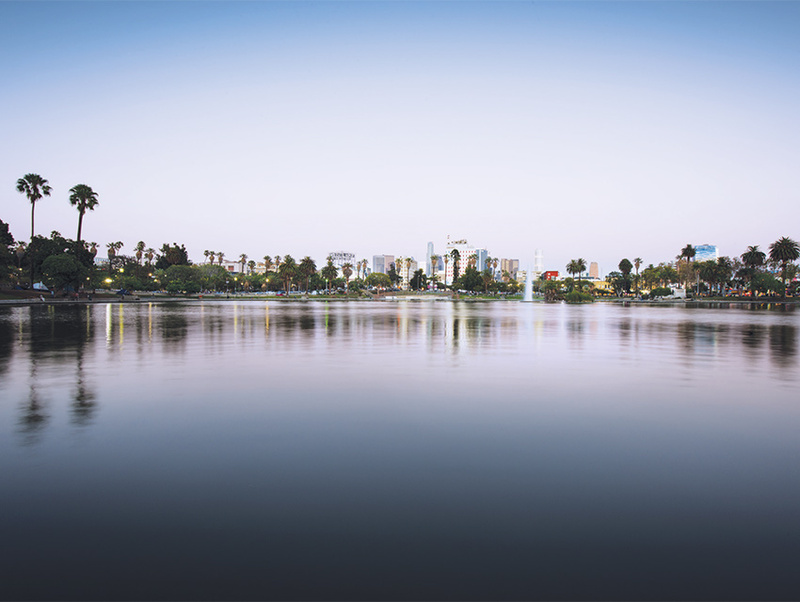 The lake initially encompassed 17 acres, spanning the two blocks between 6th and 7th streets, but engineers and landscapers have periodically shrunk and tamed it. The lake’s northern half succumbed in the 1930s: Wilshire Boulevard was extended right through the middle. Twice the lake has been drained, in the ’70s and ’90s, inspiring folk artist John Woods to assemble baroque sculptures from the artifacts he foraged from the sludge, including countless guns and knives. When I first arrived in L.A., in the mid-’80s, I was mesmerized by MacArthur Park and its latter-day frontier vibe, a rawness unlike the shallow city I had envisioned. There were chess masters among crack zombies, and so many scavengers rustling ducks from the lake, park officials removed the barbecue pits. I looked for an apartment but chickened out. The accumulation of tragedies makes it easy to forget that the lake has a long history of recreation and spectacle. It has hosted floating trees at Christmastime and mock warship battles during the Fourth of July, logrolling contests, fishing derbies, and generations of rowboats, canoes, gondolas, and paddleboats. The lake has been called Charlie Chaplin’s bathtub: Twenty Minutes of Love, one of several movies he shot there, concludes with the cast flailing in the water. A manacled Harry Houdini once plunged into the lake from the roof of a bygone boathouse, a crowd of thousands holding its collective breath as he worked his underwater magic. This summer 3,000 hand-painted inflatable spheres were set to carpet the lake for a month, an undertaking that seemed to me fraught with extravagant peril. The victim survived. Oshiro went home and barfed in the shower. I am not sure if that is consoling or dispiriting, to know MacArthur Park has to some degree always been a slippery oasis, to learn that the lake’s victims then and now are more likely to have sabotaged themselves than been disposed of by someone else. Less ominous, no less sad. I do know that the neighborhood, if not cushy, is more approachable than when it first overwhelmed me, that while living here may require a tolerance for messy civic engagement—bootleg capitalism, bullhorn evangelism—it does not entitle you to a medal of valor. I also know that at the end of 2012, three months after Roy Jacobs was fished out, we had another body: Justin Presley, who was 23 and had a flaming Superman logo tattooed on his right biceps. Witnesses saw him run toward the lake and strip off his clothes. Scuba divers, guided by sonar, found him at the bottom, curled in a fetal position. A year later Santos Lopez, an immigrant from Mexico’s Gulf Coast, died in the lake. He had two vodka bottles in his pocket, one full and the other empty. A year after that it was a man named Santos Ramos. So far in 2015, the lake has given up one body, that of William Sanchez. He was pulled from the water on January 15—exactly 125 years to the day that Harriet Hutchins, the good reverend’s wife, floated to the surface.